OPERATING ERA: 1944 to 1972. This Kit now comes with our new One-Piece Roof Frame. 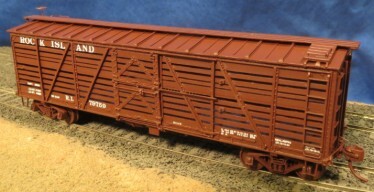 The Rock Island converted B-2 Box Cars into Stock Cars starting in 1944 and finishing in 1950. 520 Cars were converted. It is unknown how many cars had the single board wood roof. This wood roof is what remained after the metal roofs wer removed due to being worn out.